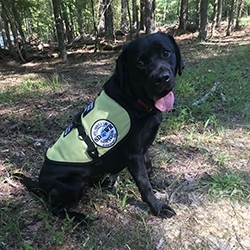 SDWR, a nonprofit service dog organization based in Madison, VA, delivered a custom trained Diabetic Alert Service Dog to a 74-year-old woman in Holly Springs, North Carolina. Holly Springs, NC, September 01, 2018 --(PR.com)-- Peggy, a 74-year-old woman in Holly Springs, North Carolina, received a very special delivery today of her very own Diabetic Alert Service Dog from Service Dogs by Warren Retrievers. Based in Madison, Virginia, Service Dogs by Warren Retrievers, or “SDWR,” has a mission to provide specially-bred and trained dogs for people of all ages that struggle with living with invisible disabilities such as Autism, PTSD, Seizure Disorders, or in the case of Peggy—Type 1 Diabetes. SDWR has hundreds of working service dogs working around the globe and is currently serving approximately 1,000 families. Debra, a black labrador retriever Diabetic Alert Dog, has already received countless hours of training through SDWR’s service dog raiser program where volunteers raise puppies in training for approximately one year. The dogs and raisers must follow through the foundation and skill set training provided through SDWR trainers at the facility in Virginia. Debra is also an honored graduate of the SDWR Fallen Officer Puppy Program. The Fallen Officer Puppy Program, also known as “FOPP,” is an initiative by SDWR to pay respect to the legacy of service by fallen American police who sacrificed their lives in the line of duty. Debra is named in honor of fallen hero Lieutenant Debra Clayton of the Orlando Police Department in Florida who was shot and killed when she encountered a wanted murder suspect in the parking lot of a Walmart in 2017. Debra’s work as a Diabetic Alert Service Dog with Peggy will carry on in memoriam of Lieutenant Clayton’s life of service before self. Peggy was diagnosed 1954 and has had Type 1 Diabetes for 64 years. Her ability to self-detect and treat hypoglycemia has been worsening drastically during the past few years. A secondary problem is that due to the duration of her diabetes, these blood glucose (BG) swings are occurring more frequently and more widely than ever before. This impacts her relative safety, overall health, and quality of life. Peggy’s husband, Frank, is likewise impacted, as he very lovingly shares the burden for Peggy’s safety, health, and attainment of normal activities and life. Frank is continually watching and sensing for signs of a drop in Peggy’s BG. Often he notices sweating or irritability and numerous times Peggy’s BG has been in the 30 or 40's range before he senses those changes. At the present time, Peggy’s only consistent recognition of hypoglycemia is a sudden and dramatic hypoglycemia-induced vasoconstriction of her retina which causes her vision to almost completely disappear. This is not only a distressing symptom, but it complicates any self-corrective efforts to restore a normal and stable blood glucose level. Night-time also presents specific problems for Peggy as she is not aware of night-time hypoglycemia. Peggy foresees Debra as being part of her family and working with them to minimize the disability of her hypoglycemic unawareness. Peggy is are hopeful that with the addition of a service dog it will help make their lives a little easier and provide a sense of independence and security. SDWR uses a proprietary scent training method to teach Diabetic Alert Dogs to detect fluctuations in blood sugar that fall outside of a handler’s healthy range. Since Debra is a service dog and covered under laws in accordance with the Americans with Disabilities Act, he will be able to accompany Peggy and her family everywhere—from doctor’s appointments, to friend’s houses, even out of state on family vacations. During the upcoming 18 months, SDWR will return to Peggy’s home every 3-4 months to continue working on Debra’s customized training, follow up training and training the human to make a successful team and public access certification. This certification can only be given to Peggy after a progression of hard work and dedication to the SDWR training program. This training program is what sets SDWR apart from other nonprofit service dog organizations.